Kagem Zambian Emerald (Ovl and Mrq), White Topaz Pendant in Platinum Overlay Sterling Silver 3.250 Ct.
AA Kagem Zambian Emerald (Pear), Diamond (Rnd 0.35Ct) Pendant in Platinum Overlay Sterling Silver 1.000 Ct.
Kagem Zambian Emerald (Ovl), Natural Cambodian Zircon Pendant in Platinum Overlay Sterling Silver 1.750 Ct.
9K Yellow Gold AA Kagem Zambian Emerald (Rnd), Natural Cambodian Zircon Pendant 1.300 Ct. 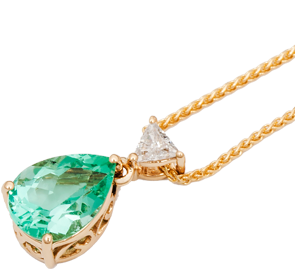 The allure of emerald pendants is surreal to see and have garnered immense popularity lately in the UK market. Emerald is a fine green hued gemstone that comes in the precious gemstone category. An emerald pendant is a prized possession of a woman as the sheer work of craftsmanship and only the best gemstone so procured makes it one most regal looking piece of jewel. A fine amalgamation it sets with sterling silver, gold and platinum meet the sky grace and phenomenal to adorn. TJC brings in a galore of rich emerald jewellery that satiates the novelty and elements of bling and brightness. Every piece at TJC undergoes research, trends, best procurement of raw materials and finally, it unleashes the brilliance that sways many minds. This is how every style speaks its own statement and garnering immense love from the masses. A combo of emerald and diamond pendant is breathtaking and unveils a tale of elegance. The charm of a diamond pendant is quite a sight to behold and when it is accompanied with the magic of a brilliant cut emerald pendant, the gaze is spectacular to spellbind. It goes well with your personality and offers the transition that you are looking to possess from spring to summer or fall to winters. It is all about the luxury that exudes in every cut and design, and the wearer admires the sheer opulence of this masterpiece for life. Gift it to your love or your mother as a token of your love and gratitude. An emerald pendant, unlike other precious gemstones, complements your sense of styling pretty well and from a small gathering with friends to a high tea party, it just shines your aura at par. Have some glitterati effect in your closet teaming up the not-so-fancy yet classy emerald cut diamond pendant for looking no less than a belle of the ball.